Total Basement Finishing™ Remodeling System Our award-winning finishing products are waterproof and mold-resistant. Thinking about a finished basement? If you want to install a finished basement floor that will not grow mold, you may believe that simply laying tiles directly on to your basement floor is a great basement remodeling idea. While this works in the rest of your home, your finished basement floor is going to need something more. If you lay ceramic or vinyl tile on your basement floor, you'll notice right away that your basement floor is cold and uncomfortable underfoot. This is because regular tile is bonded directly to the floor- there's no thermal break protecting your finished basement from the environment outside. All ThermalDry® Basement Floor Tiles come equipped with pegs that raise the tiles from the basement floor, creating a thermal barrier that makes them 8-10 degrees warmer than tiles bonded directly to the floor. While laying tile on a basement floor may slow down water vapor seeping from the concrete basement floor into the finished basement, it cannot serve as a vapor barrier. ThermalDry® Basement flooring protects your basement from the humidity seeping from the concrete basement floor from reaching your remodeled basement. Additionally, water vapor continues to pass through and is now building up underneath the tiles. ThermalDry® Basement Floor Tiles create a vapor barrier between your concrete basement floor and your finished basement area, with space for air to move underneath the tiles and for moisture to dry. Finally, a hassel-free basement floor. ThermalDry® floors provide your basement a water resistant and durable, long-lasting solution for flooring. Tiled ThermalDry® Basement Flooring is durable and made to keep your finished basement beautiful for many years to come. Unlike ceramic basement floor tiles, they will never crack or shatter. They are stain resistant, and their interlocking system assures that any scratched or otherwise damaged panels can be easily and conveniently replaced by removing the tile and snapping a new tile in its place. You will not need to tear the panel off the floor, insert a new tile and wait 24 hours to reuse the area. Click here to learn about the steps needed replace a damaged tile in your home. 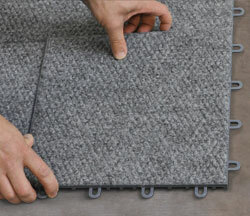 Replacement of ThermalDry® Tiled Basement Flooring is easy, and the tiles are ready right away. In fact, ThermalDry® Basement Flooring is faster and easier to install and use than normal floor tiles in both replacement AND installation. Installing ceramic tile is an involved process that requires a great deal of equipment (click here to learn about the necessary equipment). It's messy, and, and once installed, you will not be able to use the space until it's been given time to dry and set. Installing ThermalDry® Tiled Basement Flooring into your finished basement is clean, fast, and easy. As soon as the installers are done, you can begin to enjoy your finished basement floor- no waiting necessary! ThermalDry® Tiled Basement Floor Tiling is attractive! Available in Sandstone and Canyon Beige, it comes in tones that will fit the ambiance of any basement remodeling concept. Unlike floor tiles, it blends seamlessly with carpeting, allowing you to create a custom architectural look by mixing carpet and tiles together to fit any design you'd like. Contact Basement Systems to find a Total Basement Finishing Basement Remodeling Contractor near you!